On the second day of our mountain excursion, the girls and I ate a deliciously sweet and ridiculously fattening breakfast on the condo balcony. Huge muffins! Fortified with sugar and a good night’s sleep, we headed to Smoky Mountain National Park a few miles away. Before watching an excellent educational 10-minute film, we spent some time in the gift shop and fell in love with the stuffed bears. We marveled at the variety of books, hats, shirts, magnets, and coffee mugs and somehow managed to restrain ourselves from buying a souvenir. While taking a picture of the girls posing with Smokey, I sensed that someone was watching me, and when I turned around, I saw a spry, smiling woman looking at me. “You from around here?” she asked. “I’m from Ohio,” she said. “I’m here with my family.” And then, after appraising me and finding me a suitable recipient, she gave me an angel pin created from tiny pearls and safety pins.” I LOVED it! “Thank you so much. Am I pinning it on right?” I asked as I struggled with the pin. “That looks fine,” she replied, checking out the angel now affixed to my denim shirt. Before we went our separate ways, she told me she was 74 years old and walked five miles every day. Her generosity and spunkiness impressed me so much that I hugged her as we parted company. Ah, the kindness of strangers. 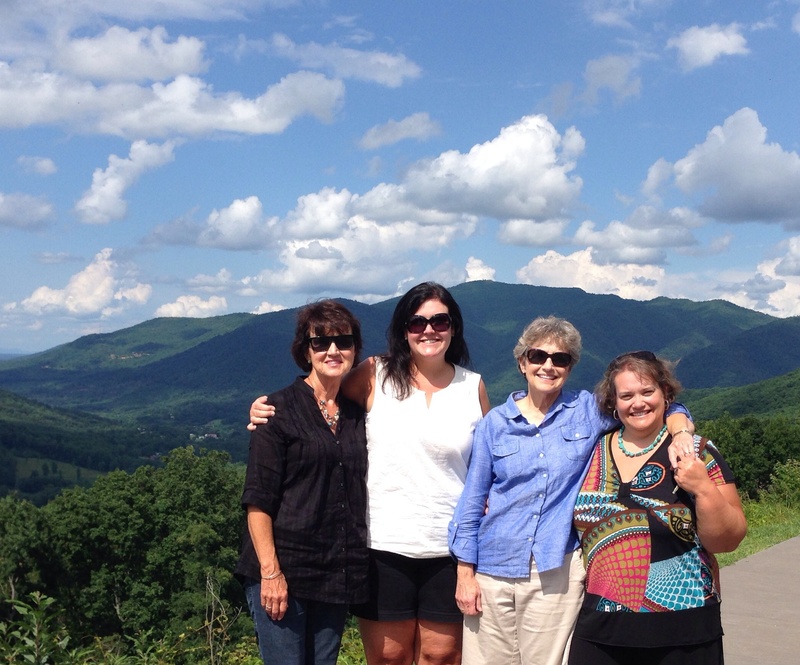 The South Carolina Foursome later motored along the 24 miles to Cades Cove. What a pleasure it was to ride down this mountainous, tree-lined road. A babbling brook was on our right for much of the journey, and we enjoyed watching the swimmers and tubers having fun. Just when we were about to get frustrated with the lloonnnggnng road, there it was: Cades Cove.To me, there’s a reverence about this quiet, restful area. I’ve only been twice, but both times, I got caught up in the beauty of the place as I pondered the lives of the people who once lived there. On a schedule, we had time to stop at only two buildings, the John Oliver home and the Primitive Baptist Church. We wondered how John and his wife raised a family in that small but lovely log home, we who have inside plumbing, electricity, and wifi. My sister, niece, and I sang “Amazing Grace” and “Holy, Holy, Holy” in the church, and as I sat in one of the pews, I tried to imagine how it would have felt to sit there 150 years ago, surrounded by believers and neighbors. After our worship service, I took a quick walk around the cemetery out back, holy ground with lots of history. Since our agreement was that each of the four of us got to do something special of her choosing, we decided to leave so that the others could do their thing. However, almost right away traffic came to a dead stop. We inched along going from 5 – 10 miles per hour for perhaps 40 minutes, halting completely several times. During one of those stops, I got out of the car and started walking along beside the barely moving cars. What was going on? I knew there couldn’t have been a wreck on this beautiful one-way road. After 30—35 minutes of walking, I came across what was probably the problem: a bear sighting in the woods. Rangers, photographers, and rubberneckers were all looking towards the woods and talking animatedly about his (her?) size, location, and behavior. At that point I realized my vulnerability. If the bear saw me and if he were hungry and if I couldn’t get in anyone’s car….Fortunately, my rescue party of three arrived about that time, and I jumped back in the car with them. All was well. We left the park for the Titanic Museum in Pigeon Forge, and although my sister and I opted for a visit to the Tanger Outlets instead, the younger set thoroughly enjoyed the museum. The exhibits were authentic and educational, and the girls spent two hours learning and exploring. Afterwards, we took advantage of a photo op outside. Hungry as bears (couldn’t resist that), we went to Mel’s Diner for a late dinner/supper. My older daughter’s birthday was that day, and we had promised to enjoy a fun meal topped off with a decadent dessert—all in her honor. We didn’t see Flo or Alice, but we did encounter some friendly servers and a fun but loud atmosphere. The food was fine, and the banana split was marvelous. Mel even serves double layer banana splits for those with extra hardy appetites. Back at the condo, we soon settled in for a long summer’s nap. We knew some good restorative sleep was needed for the next and last day’s activities. It’s hard to believe that it’s already been a week since my sister and our daughters pulled out of Camden and headed for the hills on a girls’ trip. Gatlnburg was our ultimate destination, but we enjoyed the some sights along the way too. This morning I’m remembering our daughters’ disappointment that the bears in downtown Hendersonville weren’t as”lively” as they imagined they would be. In raving about this delightful mountain community, my sister and I had both mentioned bears being up and down Main Street. Little did we know that our daughters thought they were real, so real in fact that they wondered how we’d possibly be able to dine outside. I should have told the younger set about Bearfootin’, a project created to raise money for local charities by displaying colorful artwork along the downtown sidewalks. The hand painted fiberglass bears are created and painted by local artists, and every spring there are new bears. I love them! Evidently, so do a lot of other folks because everywhere I turned, people were posing for pictures with their favorite bear. Recalling their surprise and relief about the bears still brings a smile to my face. So does thinking about our delicious lunch at the Mountain Deli, a place where tourists and locals alike gather for good food and friendly service. Housed in what appears to be an old drug store, the atmosphere is charming, especially with that great view right overlooking Main Street. Appetites satisfied, we sauntered down to Mast General Store, a favorite shopping site in mountain towns. After browsing at Mast, we strolled in and out of various shops including Kilwin’s Chocolates. Yum. What a sweet array of tempting candy! We stopped to take several pictures of bears, all attired in different types of clothing, and then jumped in the car to continue our trip to Tennessee. We came into Gatlinburg on the scenic route, complete with a tunnel and some fabulous overlooks. At first we were frustrated by the long and seemingly interminable winding road, but within a few minutes we all succumbed to its beauty. As my daughter Elizabeth said, “If we’d come another way, we wouldn’t have seen these beautiful sights.” And she was right. With several gorgeous vistas, this road afforded the first glimpses of breathtakingly beautiful mountain scenery. The above picture was taken by a friendly stranger at one of the overlooks. We finally arrived at our destination, Oak Leaf at Gatlinburg Chateaus, and checked in. The check in process went smoothly, and the staff was helpful and accommodating. We were pleasantly surprised to see that our condo looked just like the photographs. With two bedrooms, two bathrooms, a small kitchen, and a living room, the set-up was perfect for the four of us. There was even a balcony for early morning reading, journal writing, and conversing. I found this fabulous deal on flipkey.com in case anyone is considering a mountain getaway. We freshened up, and within 20 minutes we were heading towards downtown Gatlinburg (two blocks away). What a feast for our eyes. People of all shapes, sizes, colors, ages, appearance, and dress were thronging the streets, and I could readily understand why. There were attractions and restaurants galore, and we gleefully made plans for the next two days. That evening, however, we sailed right through and headed to Pigeon Forge and Sevierville. Since some of our bucket list items were in these areas, we wanted to check out the lay of the land. 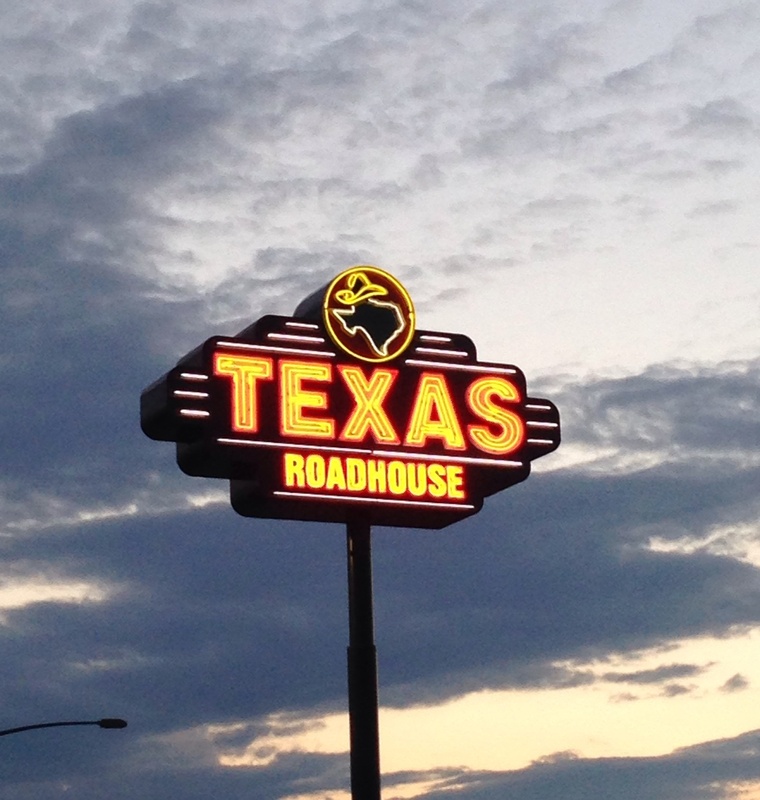 We soon spotted the Tanger Outlets and the Titanic Museum, and satisfied that we could find our way back the next day, the tired but happy foursome dined at the Texas Roadhouse in Sevierville. Eating at a locally owned and operated restaurant would have been nice, but at this point, we decided to settle for something familiar to all of us. The service and food were great, but the show going on outside of the window was even more enjoyable. We got the giggles watching a woman pick her nose, a little boy killing flies, and a man who kept putting his hands down the back of his britches. Word to the wise: People inside restaurants can see you!